Having looked at what helps uninterrupted play and what might hinder it we now want to look at the fun side. What DO children at the age range between 6-12 months do? What are they interested in? What keeps them busy? In this post we will talk about different movements and positions you may have observed in your child, different ways of understanding play at this stage, and age-appropriate toys or objects. Happy reading! A child at the age of 6 months is getting mobile. You might notice he is spending much less time now lying on his back observing his fingers. Your child will roll onto his belly. And back. Suddenly the world is upside down – or as they will soon find out – the way it really is. The neck strengthens and he will keep his head up for longer and longer times. That gives him the opportunity to look around more, follow you and your movements more. But also follow moving objects, which makes him want to follow with his whole body. And this is the challenge that will keep him busy for another while. Some children start creeping, others crawling. Some won’t do this for months. Fact is – your baby is in motion. He needs more space, a wider area to practice all those new movements. Babies can spend an enormous amount of time on their back – try it yourself, lie down, get an object (or not) and give yourself enough time to explore everything around you. You might be surprised at how much you can see. We often have the idea that babies don’t see enough when on their backs (sometimes people place cushions under their head to help them see better) – but have a look yourself, and notice that if you use your head, neck, and shoulders enough you can actually see everything you need… and maybe more! One of the bonuses of letting babies lie flat on their back for as long as they want to is the intense neck exercise they set up for themselves in that position – if you do this, no tummy time is definitely necessary to strengthen their neck. In all those turning and moving positions you will see a lot of struggle and effort. That is because it is difficult. It is a challenge. Trust that your baby is capable of doing it, and trust your instinct on when to step in and help: ‘It seems like you have had enough. I will put you back on your back’. In the Pikler home, the nurses never rolled the babies onto their backs from the tummy position – they picked them up and placed them gently on their backs. This was so as to allow the babies a chance to learn that movement by themselves. Lying on their tummy using forearms for support (head up). Lying on their tummy with arms stretched for support (now try doing that for a longer period of time and play at the same time – wow!). Lifting head, arms and legs up from the floor (who said babies need more exercise?). From this position (or any variation of it) you may see your baby pulling up to a half-sitting position (supported with one arm stretched out), and later to creeping on their arms and knees. What some of us have some to call ‘crawling’ Dr Emmi Pikler has termed ‘creeping’ (using hands and knees), what we will refer to as ‘crawling’ here is borrowed from Pikler’s terminology and means your baby moving forward in a lying position, using their arms to pull the body forward. Here you can see your baby using their arms to pull, or their legs to push their body, alternating between right and left or using both at the same time. This usually comes later than crawling, creeping and all those positions we mentioned above. We are often being told that babies should be able to sit when they are 6 months old. In our experience, if a baby is not sat up they will sit by themselves between 7-10 months, but don’t take that as a guideline. Pulling a baby up to sitting is not how he would naturally learn to sit. 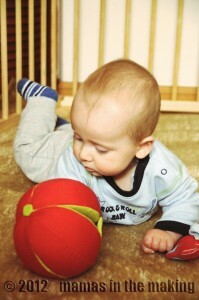 Most babies learn to sit from a side position (half-sitting), or by pulling up from crawling. Lie down on your back and try getting to sitting in different ways – which one is most natural to you? Which one comes with least effort. There are many many transitional positions, which we have not mentioned here. But as you watch your baby grow and play with their movement, you will see the growing competence, self-confidence, and joy. Learning to play through movement is the first time they are also learning to learn. So this is it. A few milestones. A bit of going back and forth in development. A bit of struggle in between and some relaxation here and there. That‘s not too hard is it? Well. We are aware that this is a learning process for all of us. In all aspects. But in the end this is what your baby does most of the time in his first years on Earth. This is what really interests them. This is part of their foundation they build on which they then keep developing. So make it possible for them. Be part of the process. And gain a good chunk of it all for yourself. What have you observed your baby do in these positions? Was there anything that surprised you? We LOVE to hear your thoughts! ‘Unfolding of infants’ natural gross motor development’ Dr Emmi Pikler and Klara Pap, RIE. ‘Pikler Bulletin’ Dr Emmi Pikler (also includes and article by Dr Judith Falk). Sensory Awareness Foundation.